One of the most essential fashion accessories are Slippers. Right pair of slippers makes a woman look chic, confident and stylish. 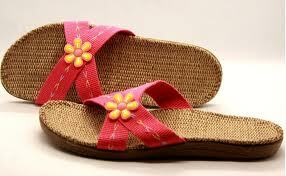 Jute slippers are in fad today due to their high comfort, quality and fashionable look. They are designed from the organic materials, Jute so that these slippers exude unmatched qualities of this natural fiber. Jute known as â€˜Golden Fibreâ€™ is one of the strongest and sturdy fibers that give a competitive edge to other materials like plastic, leather, foam and other material used to design jute slippers. Every single jute slipper is featured with the unbeatable qualities of jute crafted keeping in mind the needs of stylish woman. They are designed to make every teenager, adult or old age woman awesome and beautiful. Available in various attractive designs, styles and patterns, they are sure to meet the needs of everyone. These designer slippers are available in natural beige colors and in various vibrant colors. Jute is bleached, treated and dyed to design a range of jute slippers that win the heart of onlookers. These antique slippers of jute are not only beautiful but also in demand for high end features. These jute slippers are highly durable in nature that can easily withstand high wear and tear. They can resist fire, heat and other extreme weather conditions to ensure long lasting life. They are rough and tough yet smooth and soft to wear. They are so comfortable and comfy that a user just love to walk or stroll wearing them. Even, they are skin friendly that can easily absorb sweat and make the feet free from odor. They are embellished with myriad of adornments like beads, mirrors, stones, etc. to give them a unique look and make them perfect for every need. A user can avail these highly efficient, strong, enticing and comfortable jute slippers at very affordable prices.